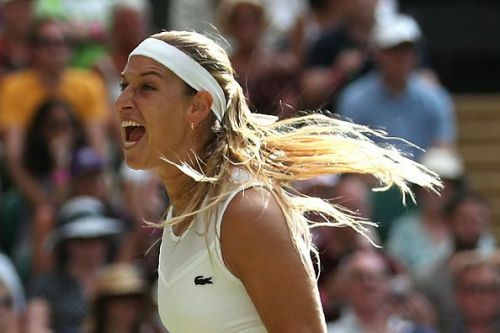 Dominika Cibulkova was the one coming out of the second round with a dominant performance at the Championships in Wimbledon on Thursday. Despite playing Great Britain’s Johanna Konta on Centre Court, she had a solid first serve, that produced plenty of points in her 6-3, 6-4 straight-sets win at the All England Tennis Club. It was a win for the unseeded player, who had the advantage of being out of the spotlight, carrying a solid offense. It was her eighth time reaching the third round of the tournament in the ten years. The two kept up their meetings since 2016 with the series leaning Konta’s way in her straight-sets win back in Cincinnati. With this being the first match on a different surface, the odds stood in the Brit’s end with the home advantage and the need for continuance. They both had rough starts to their opening round matches, but looked to put that aside in a battle for a spot in the round of 32. The two started off well on their service games with the Slovakian leading Konta down the path. They stayed even through four games until Cibulkova consolidated the first break in the sixth to open a two-game buffer between herself and Konta. It was quickly getting out of hand for the Brit as she watched her opponent get a 5-2 stance to play for the set. Konta would allow her room to dictate on her serve again and kept her first serve together long enough to keep fighting back. Cibulkova put an end to her comeback and locked down the serve in the ninth game to take the match lead after 32 minutes. Konta knew that being down early was not a position she wanted to be in long while on Centre Court and thus opened the second set with a service hold to get back on track. She couldn’t continue the momentum and instead saw Cibulkova win three straight games as she was on a mission to end the British number one. Konta got back within one to hold in the fifth game but it wasn’t enough to close the gap as the Slovakian kept going to gain a two-game gap after eight. Konta served to stay alive and luckily avoided handing Cibulkova her first match point. They went to deuce where, after four breaks and match points saved, Konta gained a fourth game win for herself, earning a massive applause from the home crowd. She wouldn’t get any more thunder as the Slovakian had the ball in hand to serve out with dominance, that gave her the upset win after 1 hour and 19 minutes. “It feels great,” Cibulkova said during the off-court interview. “It was a tough draw today and overall it’s been tough so far but I can only be happy with my performance. I play really good and it was a great match," added the former Australian Open runner-up. Cibulkova nailed 31 of 38 points on her first serve and 9 of 13 from the second, that was enough by itself to take down Konta, who struggled on the second serve and returns. She won only 11 of 51 on receiving points, which stood out as her ultimate demise from the tournament. While she prepares to regroup for the hard courts again this year, the 29-year-old Slovakian will face Elise Mertens on Saturday.